This lovely rendering of the general “hot glue experience” is brought to you by my friend Reggie. Raise your hand if this has ever been you. 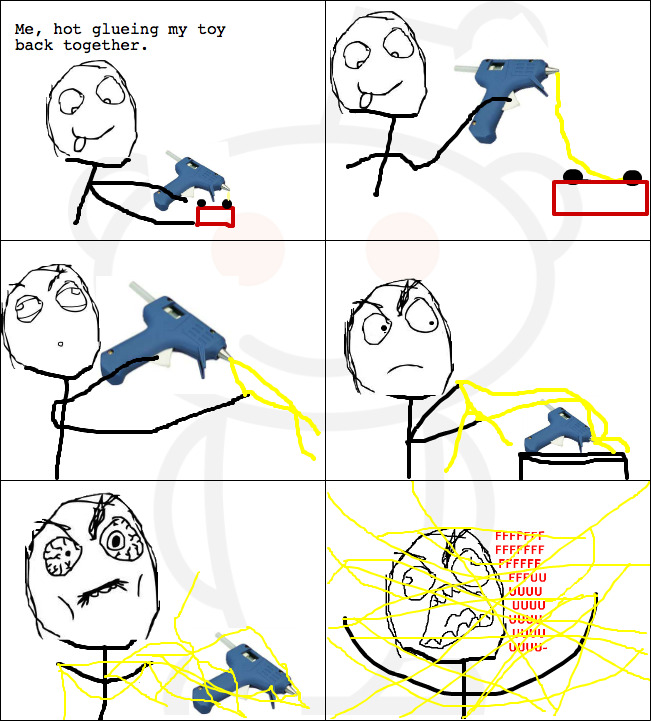 Raise your hand if this is you every time you use your hot glue gun. I have a confession to make. I used my hot glue gun this weekend. The frustration of the strings will always be there. And many F’s are thought (but none said!). I also got a little carried away with online shopping this weekend. I have been having dreams/nightmares about my purchases ever since. I had a horrific dream that the furniture showed up as zebra print, and they wouldn’t let me return it. Shutter. I will tell you a specific purchase I made. Miss Mustard Seed‘s milk paint. Out of all my purchases, I am most excited for this one to show up. I have been chomping at the bit to get my hands on this stuff and try it out. I won’t tell you what I’ll be doing with it (yet). But I will tell you I can’t wait to see all the chippy goodness! Follow Interiors By Kenz on Facebook! This entry was posted in Random Nothingness. Bookmark the permalink. Though in my house, many “F”s are said. Along with many a “SEAMUS!” as he really likes to be involved. Bahaha! Oh Seamus 🙂 You know, ever since we started our swear jar things have been a little different around here. “Shingus!” is probably the word of choice.